Europa Universalis IV is the pinnacle of the grand strategy genre; a game that got its claws in me last year and has not let go. Continents to conquer, trade routes to monopolise, armies to smash – there’s almost too much to do. But in typical Paradox fashion, we’ve been given more to do anyway. Conquest of Paradise changes the world. Literally. On top of changes to the colonial game and fleshed out American natives, Earth’s tectonic plates have ruptured, creating a New World that bears little semblence to our own. Yet with all these new toys, this paradise feels a little empty. I love playing the underdog. It likely has something to do with being Scottish, but I get a kick out of struggling against nearly insurmountable odds. 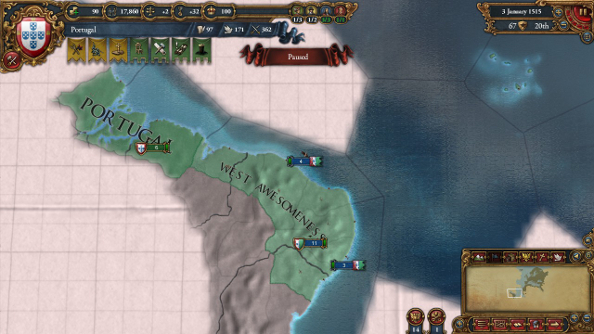 The native tribes of the Americas are EUIV’s underdogs, but they were a chore to play. You do nothing for a hundred years, try to westernise when the Europeans arrive and then get steamrolled. Conquest of Paradise attempts to change all of this by putting some meat on those Native American bones. And these tribes have certainly become more viable, even to the point where they can send the foreign invaders packing. Immediately noticeable is the number of tribes, particularly in North America. 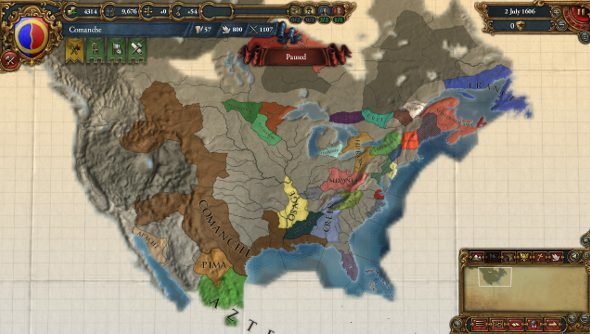 There’s a slew of new native nations to play as, spreading across the entire map. And these groups have their own native tech tree to work through before the invaders arrive, as well as native idea groups. I opted to play as the Comanche. They start off in a safe position, with their backs to the Rockies and only a few tribes near them. Before them is a mass of empty land, primed for colonisation. Before this expansion, the natives had to wait a long time to get colonists, but now it’s one of the native-specific techs. 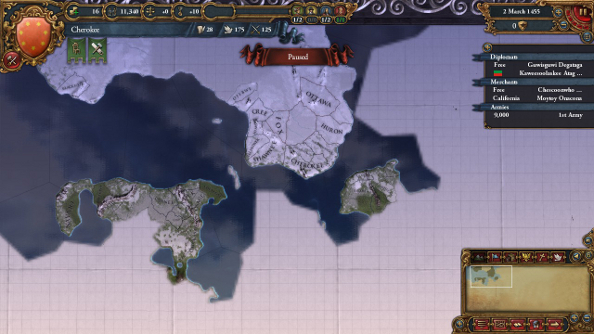 I swallowed up the tribes closest to me, and slowly made my way down south to gobble up wealthy coastal provinces. In another game, as the Cherokee, I employed the new migration mechanic, ditching my single province for more fertile ground, gaining a boost to my monarch points. It’s a great way to progress quickly if you aren’t concerned with carving out a gargantuan empire early on. By the time the Europeans arrived, Brittany taking Florida and both the French and British slicing up Canada, my Comanche empire was already fairly advanced. Each of the native tech rows (Administrative, Diplomacy and Military) have techs that reduce the later trees costs by 100%, massively reducing the penalties of leveling up my civilisation along similar lines as the Europeans. But by the time of the invasions, things had started to feel the same as they always had. I needed to westernise, my allies got swallowed up, and my back was against the wall as I was fighting the great European powers. Federations, which are massive native alliances, didn’t do much good, as the moment the natives chose to westernise they left my Federation. There’s also a peculiar omission that makes the native experience feel a tad hollow: there aren’t many native-specific events. Getting messages about bailiffs and bankers, astrologers and scholars was mighty strange when I was leading a pre-westernised civilisation with none of those people. They’re just rehashes of Old World events. 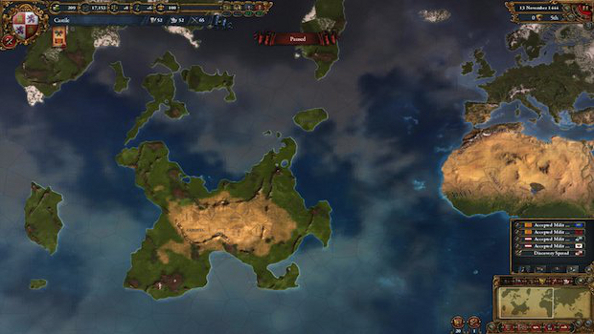 The colonial game has had a lot more work put into it, and sees some massive, sweeping changes that entirely alters the experience for any players wanting to construct world-spanning empires. As Portugal, I pushed west, looking to establish a colony in Brazil. It went as expected, with little changing from the core game, until I’d fully colonised five provinces in the same region. It was then that a new event occurred, the creation of Portuguese Brazil – although I named it “West Awesomeness”. West Awesomeness became a semi-autonomous colony, essentially a distant vassal. I could select the governor, though if I didn’t go with the popular choice the colonists would start demanding liberty and freedom, and I could even continue colonising the area, adding more provinces to West Awesomeness. In concept, it’s great, and certainly more historically accurate, but in practice it’s a bit flat. These colonies simply don’t do much. They don’t tend to expand of their own volition, requiring either your aid or the assistance of trading companies which will settle new areas, and they aren’t proactive when it comes to threats. One of the ports in West Awesomeness was blockaded by pirates for over 50 years, and they did nothing about it. I could have dealt with it myself, but I wanted to see if they’d react. They did not. Things get interesting when the colonies start getting angry with their big brother back in Europe. Taxation and ignoring the voices of the colonists will increase their desire for liberty, eventually leading to them grabbing the pitchforks, forming mobs and demanding independence. You can fight against their autonomy or, and this is where it gets really fun, switch sides and play as the colony, ensuring its success as an independent nation. These newly formed nations get their own national ideas, events and goals, making them entirely separate from the old fuddy duddies back home. It’s a chance to play as a brand new nation or even form America. And all this could take place on a map that looks like the cartographer designing it had a stroke. 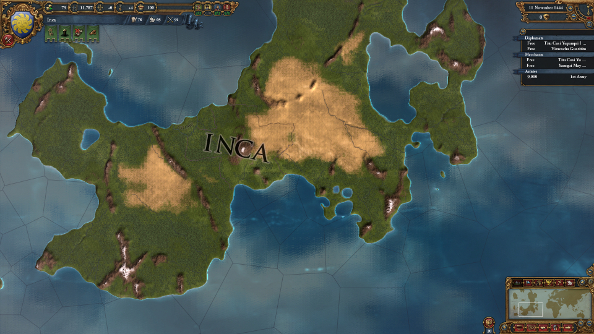 The Random New World feature creates a bizarre new version of the Americas, from massive archipelagos to vast supercontinents. There’s a real sense that you’re exploring a new world, the same feeling that the first explorers and colonists surely got. When you send those first ships across the Atlantic, you don’t have a clue what you’re going to find. There’s still some real-world consistency, though. Trade goods tend to show up where you’d expect them, and you’re still probably going to find the Aztecs south of the Native Americans, but how far south is anyone’s guess. It can be annoying when the New World ends up incredibly far west and becomes very difficult to colonise, and spreading your empire across an archipelago is a pain in the arse, necessitating fleets of cogs constantly shipping troops between the different islands. But it provides new experiences and new challenges, which is certainly one of the most important remits of an expansion. Though the natives still feel underdeveloped and the colonies don’t really become interesting until they attempt to gain independence, Conquest of Paradise is still a welcome addition to Europa Universalis IV. It adds more than it takes away, and it still manages to improve the areas it dabbles in even when some of the improvements don’t go far enough. Most importantly, it’s the best way to experience colonisation, creating new tension and many excuses for huge, global wars.